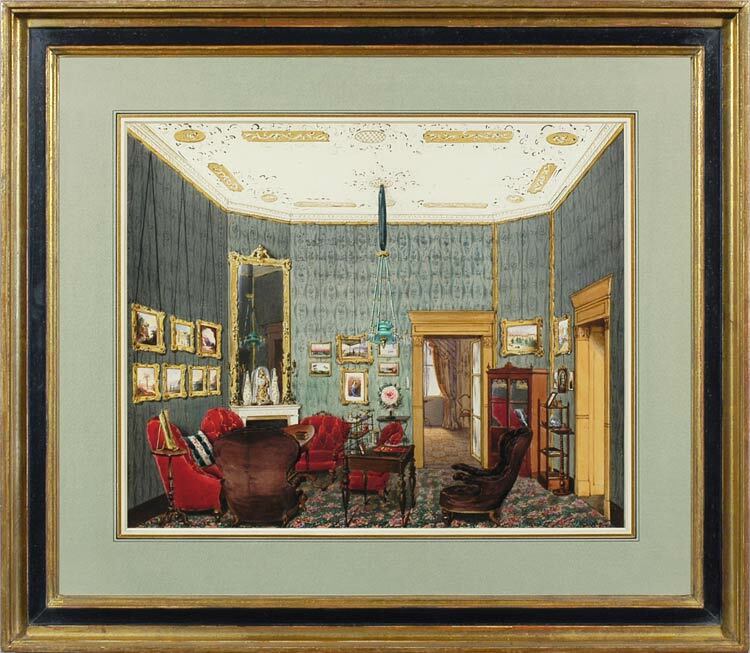 A beautifully detailed watercolour of a Viennese drawing-room, showing the changing styles of furniture and interior decoration in the middle of the 19th century. The deeply-buttoned chairs and sofa are upholstered in the fashion which came in during the 1840s, whereas the shaped pelmet or lambrequin at the window in the further room is in the newest style. The ceiling decoration may be either of plaster or papier mâché. The combination of greens and reds, the patterned wallpaper and carpet, the closely-grouped pictures and numerous ornaments, all bear witness to the growing horror vacui of the century, the love of accumulated objects and patterns. Pitner’s charming painting has caught the love of both comfort and ornament, faithfully reproducing the smallest detail – the étagère burdened with little bottles and bibelots, the clock under its glass dome, the oval Viennese table and the pendant glass lamp. Franz Pitner (1826-92) was born in Vienna and trained at the Academy there. From 1853-54 he studied in Italy, specifically in Rome where he was influenced by Pessini; and then moved to Venice to work, becoming drawing-master to the Duchesse de Berry. The Duchesse was the daughter of Prince Ferdinand, later Ferdinand I of the Kingdom of the Two Sicilies and Infante of Spain, and of Clementina, Archduchess of Austria and daughter of the Holy Roman Emperor, Leopold II. She had married Charles d’Artois, nephew of Louis XVIII, thus becoming Madame de Berry; their son would become Comte de Chambord, pretender to the throne of France. The Duc de Berry was assassinated in 1820, and the Duchesse married an Italian noble, the 8th Duke della Grazia. Whilst in Venice Pitner painted a number of genre scenes and figure studies. He then returned to his native city, Vienna, where again he produced genre scenes, portraits and lithographs. He continued to teach in Vienna, one of his pupils being Charlotte Lehman (b.1860); see C.E. Clement, Women in the fine arts, from the 7th century BC to the 20th century AD, 1904. Works in public collections include a watercolour of Fanny Elssler (1810-84), the Austrian ballerina, in the municipal art collections of Vienna (according to Benezit); a print after Venetian serenade, British Museum.